There is a good article in the, Drinking Made Easy on line magazine, all about Polish beer. The photo in the article is fantastic. 5.7% gold colour with no head, slight malt aroma, not much taste, I thought it was an ordinary lager, although the article rated it was one of the best. HA! 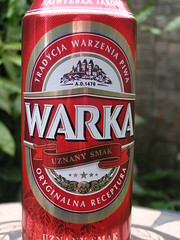 Funny you reviewed Warka, as it was the beer that got me quite into Polish beers. Admittedly, it wasn't their lager, but their "Strong" that did the job.